Welcome to the Recreation Department Home Page! The mission of the Recreation Department is to create community through people, parks and programs. 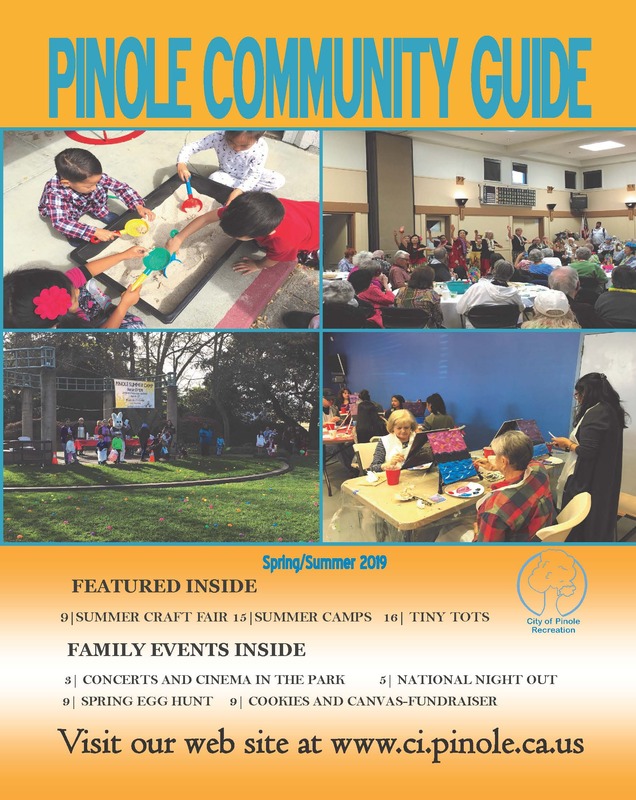 The department goal is to provide safe, high-quality programs, parks and recreation facilities that meet the needs of the diverse Pinole Community. The Recreation Department offers a wide range of recreational programs, services and events for youth, adults and seniors to keep the community engaged in recreation activities. We invite you to visit our Senior Center, Youth Center and Tiny Tot facility to learn more about the programs offered. The Recreation Department also hosts various community events throughout the year, join us for Tree Lighting Festival, Spring Egg Hunt, Community Service Day, Halloween Carnival, Movies and Sounds in the Park. In addition, the Recreation Department offers park, field and facility rentals. Click icon above to complete program registration, park and facility reservations​. Click on our Community Guide above to find additional information on programs, services and events offered throughout the Recreation Department.